For ten years, since she fled from the College where the magically gifted are taught, Kisea has been living on the run, concealing her unusual and frightening telepathic gift. Only her sorcerer ex-lover Matt knows, and has been looking for her. When his cousin is kidnapped, matters quickly grow even more complex. Ten years ago, at the College where sorcerers and telepaths and lifewitches learn about their gifts: boy meets girl, girl discovers her own frightening abilities, boy loses girl when she runs away from the authorities who would condemn her for those abilities. Ever since, Kisea has been in hiding as a renegade, with a new name, never staying anywhere long, never letting anyone find out too much about her. The uncommon telepathic gift that earns her blessings when she heals minds would, if anyone knew its full nature, evoke only fear and horror: controllers are, after all, monsters from a fireside tale. The one person Kisea has ever trusted completely, during the interval between a childhood of inherited shame and an adulthood of paranoia, is the one person who knows what she is and the one person who would recognize her immediately – and he’s under an Oath to return any renegade to the College by any means necessary. Ever since, Matt has been watching for her, and looking for a way to help. She’s still alive, at least; knowing what to watch for, the rumours and traces of an ever-moving half-siren mindhealer of extraordinary strength are unmistakable. Now in a position of considerable authority and responsibility, he believes he knows a way – if he can only find her and persuade her to listen to him. She’s the last person he expects to trip over when his highborn cousin Kallima is kidnapped, but when the situation turns out to be far more complicated than it appeared, that unlikely chance could make all the difference for everyone involved. Note: siren sexual nature is misunderstood by many in Caalden, and as a result they are frequently the targets of abuse. While there is little explicit description in Renegade, please keep this in mind if this is an issue for you. This one has a bit of a history behind it, which you can find at my writing blog here. This, and others forthcoming about the same family, are a resurrected version of some of my oldest writing, which I tried an experiment with. I’m too pleased with the result to condemn Kisea, Matt, and company to oblivion. 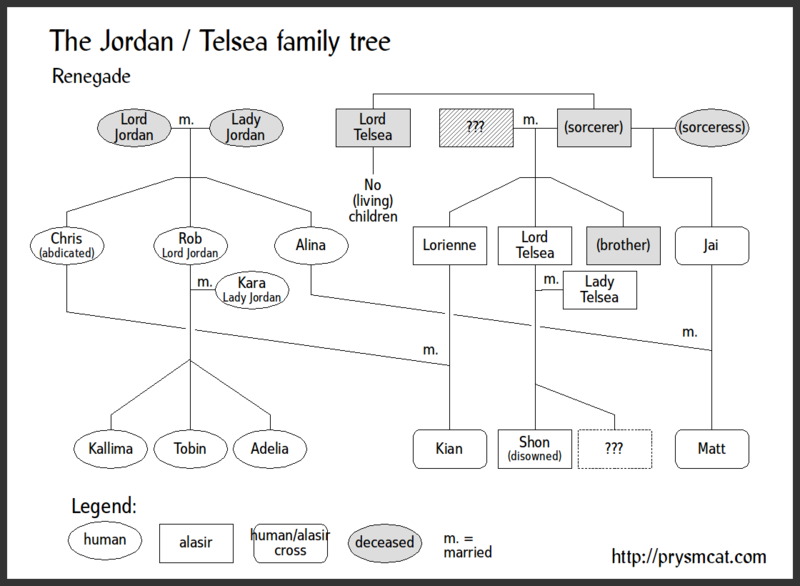 As promised, here’s the family tree in visual form. Find Renegade on Smashwords and various ebook platforms! If you have any problems with the formatting, please let me know so I can (try to) fix it! Print version via Lulu.com: available eventually, faster if anyone requests it.